Jill Meyer, president and CEO of the Cincinnati USA Regional Chamber. 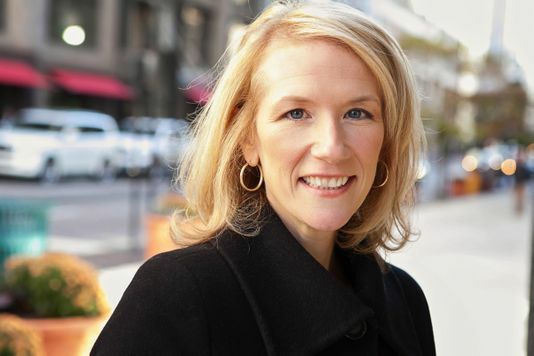 Jill Meyer is president and CEO of the Cincinnati USA Regional Chamber, one of the largest metro chambers in the nation with 4,000 member businesses from 15 counties in Southwest Ohio, Northern Kentucky, and Southeastern Indiana. Jill has set the Chamber on an aggressive course designed to grow the vibrancy and economic prosperity of the Cincinnati region. Before joining the Chamber, Jill practiced law for twenty years at Frost Brown Todd, and served as the Member-in-Charge of the law firm’s Cincinnati office. A dedicated volunteer for many civic and community causes over the years, she currently serves on the boards of 3CDC, Downtown Cincinnati, Inc., City of Cincinnati Department of Economic Inclusion Advisory Board, Hamilton County Transportation Improvement District, and Art of the Piano. She is a member of the United Way Tocqueville Society and ArtsWave Women’s Leadership Roundtable. Jill has been honored as a YWCA Career Woman of Achievement, a Cincinnati Business Courier Forty Under 40 recipient, and is an alum of the Chamber's inaugural Women Excel (WE) Lead class and Leadership Cincinnati Class 34. In 2016, she received the Difference Maker Award from the American Bar Association and was recognized by the Cincinnati Business Courier as a Woman Who Means Business. We caught up with Jill recently to get her views on the Cincinnati region’s innovation economy and how the Chamber is helping to drive it. What role does the Regional Chamber play in the innovation economy? The Cincinnati USA Regional Chamber serves nearly 4,000-member businesses and their 300,000 employees. 83% of those firms are small businesses and we take to heart our responsibility to work on their behalf on issues like talent attraction and retention, transportation, and in particular, connecting more people to jobs, education, and healthcare. Recently, we announced a new partnership with Cintrifuse, giving startups easier access to Cincinnati Chamber membership and its many benefits. And the Cincinnati Chamber’s Minority Business Accelerator is accelerating the development of sizable minority businesses while expanding and strengthening the regional minority entrepreneurial community. Our talent pillar is focused on expanding and diversifying the talent base. In addition to our CincyisIT.com portal to attract new tech talent to the region, the Chamber is also partnering with Cincinnati Public Schools to introduce high school students to career pathways through pre-apprenticeships in technology with our region’s businesses. Additionally, we will be launching a skills-based hiring model of middle-skill tech talent in the coming months. What does our region need to do to continue growing its innovation economy? The Cincinnati region, like many areas around the country, is in a war for talent. Our challenge is not unique, but our ability to solve against the challenge is. The Cincinnati Chamber has assembled a diverse Talent Initiatives team to attract new residents to fill available jobs, develop leaders and find innovative ways to close the workforce gap. Collaboration is key. The Cincinnati Chamber is recruiting new tech talent through partnerships with Kroger technology and initiatives like our new website, CincyisIT.com. And we’re working to fill future jobs in IT and advanced manufacturing through a pre-apprentice partnership with regional businesses and Cincinnati Public Schools. It offers students the opportunity to work while at CPS and get a taste of available jobs and sectors. We’re engaging future talent through the Cincinnati Intern Network Connection (CINC), a summer event series exposing interns and co-ops to all our region has to offer, with the goal of keeping these students in our region after graduation. 2018 is also the second year for The Big College Event which brings together thousands of students from regional colleges and universities to connect with internship opportunities, interest groups, social scenes, community engagement and our unique Cincinnati flavor. Additionally, we helped the Mayor’s office launch Cincinnati Compass which is operated by Steve Driehaus and Bryan Wright. Cincinnati Compass is a collaborative project with the University of Cincinnati, 60 community partners and an expanding list of investors to welcome, with open arms, immigrants into the Cincinnati region. We know that immigrants are key to a robust economy and a vibrant community. What national innovation trends do you see impacting our region in 2019? There’s a lot going on in transportation and transit. We’ve looked closely at the national picture and especially at the innovative things being accomplished in many of our peer cities. The truly successful regions, when it comes to transportation, have a clearly-defined vision for the magic they wish to create and a broad, diverse set of stakeholders willing to roll up their sleeves and get dirty in making their vision of connecting people to jobs, education and healthcare a reality. That’s why earlier this year, we have launched The Connected Region, our region’s vision for connecting people to all that our region has to offer. The Cincinnati Chamber is fortunate to have transportation experts on its team and a driven group of business, civic and transit leaders working together to make Cincinnati a more connected region. Earlier this year, Uber announced a first of its kind, multi-year partnership with a collaborative of regional Cincinnati organizations to create the Cincinnati Mobility Lab. The Lab will share data, conduct studies, engage employers and activate designers to help deploy new tools that help connect the Cincinnati region. I can tell you this partnership is much coveted by cities around the nation and the globe. In what business sector would people be surprised to find a strong innovation culture? From what our members tell us, manufacturing is still fighting an image problem. These are not your grandfather’s factory jobs. Manufacturing, especially advanced manufacturing, is high-tech, has some of the highest average wages and some of the lowest turnover rates. From additive manufacturing to robotics, connected devices and AI, our region’s businesses are leading in Industry 4.0. Manufacturing is the largest of 20 economic sectors in Ohio, with a $40 billion annual payroll and a gross domestic product of $106 billion - the third highest in the nation. More than one in 10 Ohioans – including 117,000 of our Cincinnati neighbors - are employed by manufacturers. You can understand why it’s critical that we’re working to fill the hundreds of thousands of manufacturing jobs that will become available in the next ten years. What is the one thing you want people to know about the Cincinnati innovation scene? When we talk about tech jobs in the Cincinnati region, it’s important to know that we’re not only talking about jobs working for tech companies. Cincinnati has tech talent! It’s thriving throughout all our sectors and its driving companies like P&G, General Electric, Kroger and so many more. We’re also working on the second iteration of BLINK, the art and light event that brought one million visitors to downtown Cincinnati and Over-the-Rhine in 2017. BLINK, October 10-13, 2019, will again feature artists and creatives from around our region, our nation, and our world, reinforcing and securely planting Cincinnati on a global map as an innovative, diverse and creative future city. The Cincinnati region has an entrepreneurial ecosystem that is gloriously diverse and multi-faceted. We have tech-based, hyper-scalable, venture-backable startups as well as Main Street businesses that create jobs and deliver excellent quality of life to our citizens. From Cintrifuse, CincyTech, UpTech, Ocean and HCDC, to Mortar, Aviatra, First Batch and Artworks’ Co.starters, this is a place to build and scale a businesses and we have the track record to prove it.